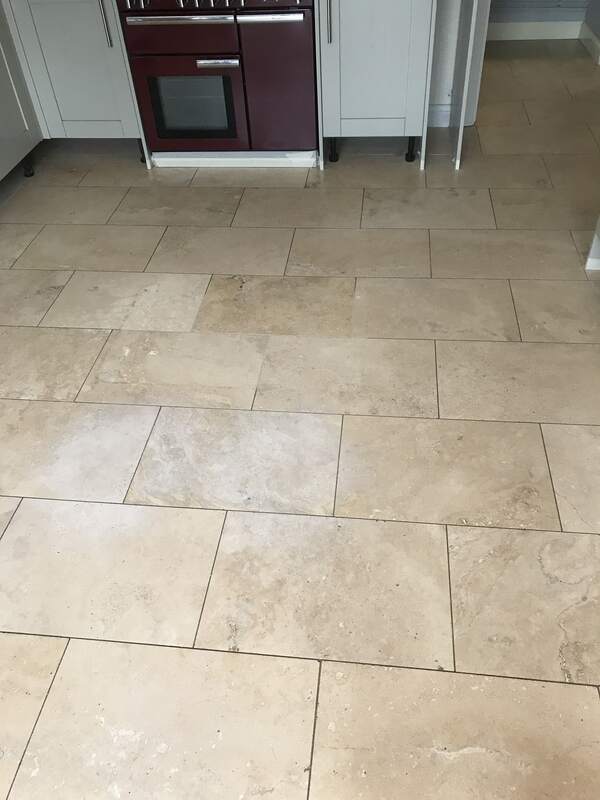 The pictures below are from a Travertine tiled Kitchen floor I was asked to clean recently at a house in Stoke on Trent. The floor was laid about five years ago and always had a matt appearance and never had a shine at all. I went over to look at the floor and was able to use a spare tile they had to show them how shiny I could get the stone. They were really impressed with the result and could now see the potential of their floor, so they booked me in straight away. 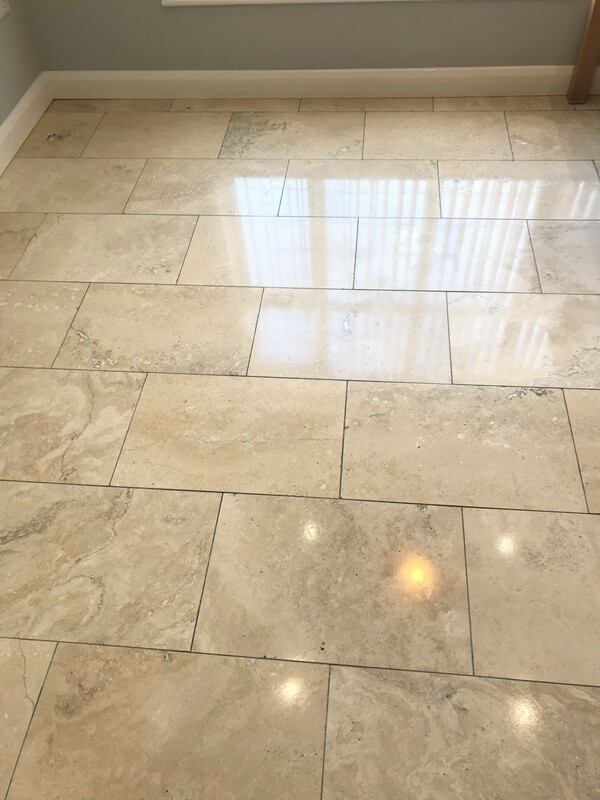 Restoring the shine on a polished stone such as Travertine, Limestone or Marble requires the surface to be stripped back and then buffed, which we did by using a set of burnishing pads. These diamond encrusted pads come in different grades from 400 through to 3000 grit and each one does a different job from scrubbing to polishing. I started with the course red 400 grit pad together with a little water to help lubricate and then carried on with the medium Blue 800, then fine Yellow 1500 grit pad, then very fine Green 3000 grit burnishing pads. My last task for the day was to give the floor a good rinse to remove any remaining soil and then dried the floor as much as possible using a wet vacuum before leaving the floor to dry off overnight. 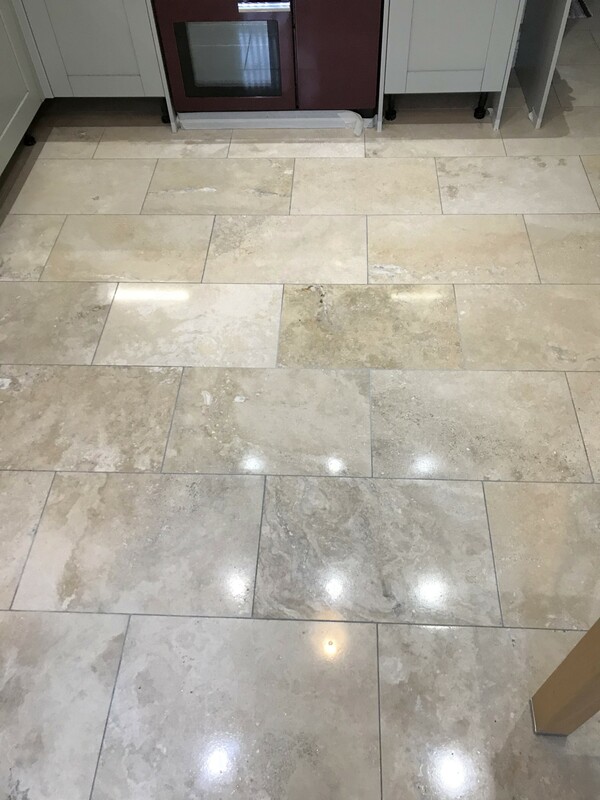 On our return the next I applied a single coat of Tile Doctor Colour Grow which is a specially designed stone sealer that brings out the deep colour of the stone. Once this had dried I worked in Tile Doctor Shine powder with a buffing pad to give a really deep and durable finish. Before leaving I finished the floor off by spray burnishing the floor with an ultra high speed burnishing machine fitted with a white buffing pad. For the first time in five years the Travertine floor has a deep shine and my customer was really pleased with the outcome. 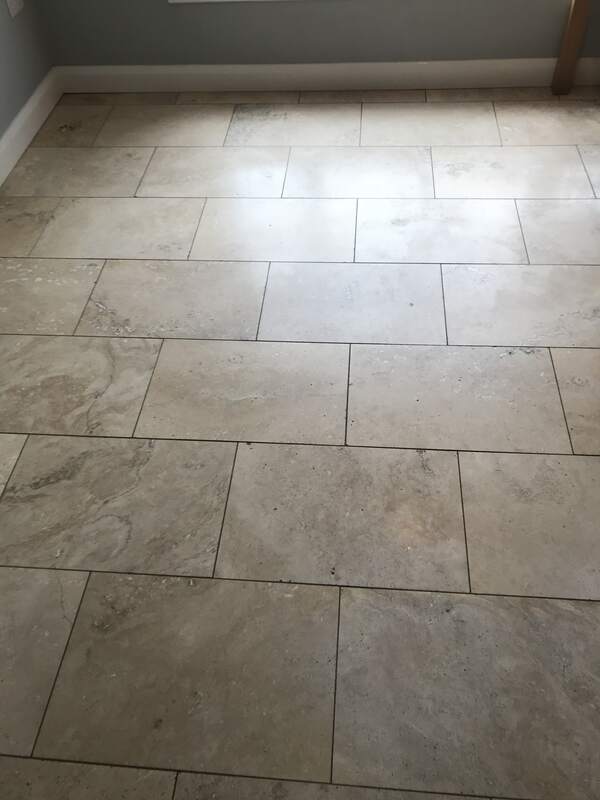 This entry was posted in burnishing, Cleaning, Floor, kitchen, polishing, staffordshire, stoke on trent, Tile Cleaning Activities, Travertine, Work History by TileProf. Bookmark the permalink.